Contingent upon your school or work calendar, Spring Break is either coming up or already upon you and in Michigan that can mean either high temperate days or blizzards. If you are not traveling for Spring Break, it can be a perfect time to relax and regroup as a family — particularly in West Michigan, where there are so many great restaurants, museums, and parks. 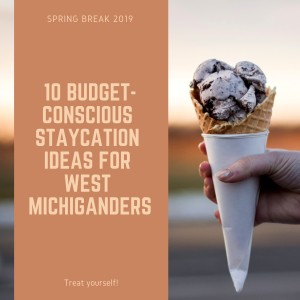 Because we understand it can be difficult to figure out which ones fit into your budget, here are ten family-friendly, cost-effective Spring Break ideas for West Michiganders. WM Kellogg Bird Sanctuary, Augusta, MI (15 miles north of Kalamazoo.) Home to Canada Geese and other migratory birds: waterfowl, raptors, and other game birds, this 180-acre sanctuary provides visitors an opportunity to enjoy nature, walk the 3-mile loop, and feed some of the birds with corn (provided by the sanctuary for $1). The outdoor grounds, including Wintergreen Lake, are open year-round from 9 A.M.-5 P.M. If you want to visit the Resource Center and learn more about the birds, they are also open during the weekdays from 9 A.M.-5 P.M. and 11 A.M.-4 P.M. Saturday and Sunday. Cost is $5 for adults, $3 for kids (ages 2-17), and free for any children under 2. They usually have specific events noted on their page, so make sure to check out their website and see what they have coming up for your next (or first) visit. Critter Barn, Zeeland, MI. This interactive farm aims to teach children and adults of all ages about the benefits of farming and agriculture. Open Monday-Saturday 10 A.M.-6 P.M., Critter Barn encourages you to build your own adventure by participating in a guided tour, having a picnic lunch, or interacting with various farm animals — you have the option to hug the rabbits or feed the cows, the Critter Barn has something for everyone. They only ask for a donation upon entry, but they make it a point to say that they will not turn away any visitor who may not have the resources to donate. Find out more. Blandford Nature Center Grand Rapids, MI. Located on the Northwest side of Grand Rapids, Blandford provides excellent family-friendly hiking options, great exploration of nature, and many of opportunities for kids and parents to learn about the ecology and sustainability of the critters and creatures who live near the Grand River. Open Monday-Saturday 9 A.M.-5 P.M., a $3/person admission fee applies for non-members. Plan your hike. John Ball Park Zoo, Grand Rapids, MI. There are lots of great zoos in Michigan, including Binder Park in Battle Creek and Potter Park in Lansing, but John Ball has something unique to offer in that they have some great exhibits from around the world including “Pelican Pier,” “Crawford Tigers of the Realm,” and a “Frogs” exhibit featuring over 50 different types of frogs, toads, and salamanders. Hours are currently seven days a week 10 A.M.-4 P.M. and the price of admission is $10 for adults and $8 for kids ages 2-12. You can check out more information about the exhibits you might want to catch here. Grand Rapids Art Museum, Grand Rapids, MI. Grand Rapids is home to some awesome museums, including the Grand Rapids Public Museum with its infamous 75-foot whale. But an often-overlooked museum to take advantage of is the Grand Rapids Art Museum (GRAM), especially because there are a few times during the week where admission is free. Meijer Free Days are on Tuesdays from 10 A.M.-5 P.M. and Thursday evenings 5 P.M.-9 P.M. At the GRAM you can enjoy numerous activities including tours about various art movements and interactive activities for children. Find out more about upcoming events. Muskegon Winter Sports Complex, Muskegon, MI. If it happens to be cold and snowy during Spring Break, don’t fight it, embrace it at the Muskegon Winter Sports Complex. This outdoor complex offers ice skating, cross country skiing, and even an Olympian-Designed luge. Hours of operation are subject to change based on the weather, so make sure to call or check their website ahead of time. Prices also vary depending on the activities you choose but rest assured, if cold weather hits, the Winter Sports Complex is a great place to head and burn off energy. Holland Shopping District, 8th Street Holland, MI. A favorite downtown walking strip, Holland is close to Lake Michigan and a popular springtime destination during the Dutch Tulip Time (May 4-12). However, even in cold weather, the Holland Shopping District has some great stores to duck into, including Reader’s World bookstore, puzzles and games at Sandcastles for Kids, and home appliances at the classic (established in 1941) Teerman’s (over 1000 clocks in stock). Beyond shopping, this popular destination boasts great restaurants (Crane’s in the City and the original New Holland Brewing), fun coffee shops (Lemoncello’s), and even a Farmer’s Market on the first and third Saturday of the month from 9 A.M. -12 P.M. throughout January-April. Holland is an excellent family-friendly destination rain, snow, or shine. Vander Mill’s Cider, Spring Lake, MI. Opened in 2006, this Cider Mill in Spring Lake has become one of the most popular spots in West Michigan and distributed throughout the Midwest. Vander Mill’s Totally Roasted is a special nut-cider, and their Hard Apple is a standard favorite. They have indoor and outdoor seating (weather permitting) and excellent fresh food that rotates often, so check out their menu and going-ons. They are open various hours Wednesday-Saturday and feature a Sunday Brunch 10 A.M.-3 P.M.
Hudsonville Winery, Hudsonville, MI. Located right off M21, in “Salad Bowl City,” this winery offers a dozen wines, and even “frozen” slushy-style wines. But they are not just a winery — Hudsonville Winery works in conjunction with Pike 51 for some tasty brews, too. In addition, they offer a great homemade root beer on tap for the kids. Plus, they have a plethora of pub fare (sandwiches, nachos, and burgers) to satiate anyone’s appetite. They open at noon every day and have various evening hours throughout the week. Check out their tap list, wine list, and food menu. Coral Gables, Saugatuck, MI. Even though it isn’t summer, visiting Lake Michigan allows for just a taste of what’s to come. Bonus, by visiting in the spring, you can beat some of the crowds. Coral Gables, a local favorite, is a great place to enjoy the views of the channel through large picture windows. An early 20th Century hotel and bar, Coral Gables is considering what it might take to turn part of their upstairs into a functioning hotel. Located close to all kinds of shops, art, and views, Coral Gables in Saugatuck is a great potential location for any south-western Michigan visit. Check out a bit about their history. Coral Gables is open 11:30 A.M.- 2 A.M. every day.